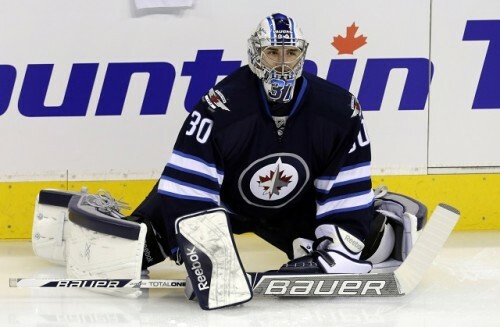 The Winnipeg Jets have had a less-than-stellar season as far as goaltending is concerned. Between Ondrej Pavelec and Michael Hutchinson, they’re just not making the cut. The Jets started off with a decent record, but now Pavelec is 5-6-1, and Hutchinson is sporting a better, but not great, 5-4-1 record. As proved in the last playoff run, the depth in net is not playoff ready. Regardless of whether or not the team makes it to the post-season, without changing up the netminders, they won’t make it very far. Jets’ coaching staff finally caught up with that and called up Connor Hellebuyck from the AHL affiliate team, Manitoba Moose. It’s unfortunate that it’s under the circumstances of Pavelec being injured. While Hellebuyck’s record of 2-7-1 with the Moose this season is nowhere near what he is capable of, he’ll be a great fit with the Jets on the ice. Hellebuyck was incredible between the pipes just a few years ago while playing for UMass Lowell. For those unfamiliar with him, he had a 20-3-0 and 18-9-2 record for his two season playing with UMass Lowell. He also helped them achieve two back-to-back Hockey East championships and recorded three shut outs in the four games of the tournament. Changing the rotation for goaltending will help solve some of the problems, but the defensive pairings that don’t change very often need to be reevaluated. The potential of a trade involving a Jets’ defenseman and the Islanders’ Travis Hamonic has been mentioned. There are rumors circulating about potentially trading Jacob Trouba or Tyler Myers, but the best bet would be trading Dustin Byfuglien. Byfuglien was a forward while playing in Chicago, and that has transferred to him being a very offensively minded defenseman. Not a bad thing, but not the best when he is the only defenseman producing any points. Byfuglien is a powerhouse, so naturally a trade would include more than Hamonic if that were the route they decided to take, but it is a good one to consider, in my opinion. Take a look at Byfuglien’s history, the only defenseman that we worked really, really well with was Toby Enstrom, and they’re never paired together anymore. To me, the Byfuglien-Hamonic trade would be beneficial to the team to change up the depth and the pairings. Jets coaching staff needs to switch up the pairings and start Hellebuyck and see what comes of that.